My project is nearing the end. I want to support language by country. And I find in playmaker ApplicationGetSystemLanguage. But, I have no idea.how to use this. Re: How can i use ApplicationGetSystemLanguage? the ApplicationGetSystemLanguage gets the system language, and returns it as a string. this way you know what the default language is on the pc/mac/android/... Device. 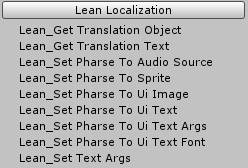 Then its up to you how you set the languages. you can use for example arrays start with a list with your supported languages. then have an array for each language. Sorry, I still do not understand. Can I get some example? And this is my setting. Hi, I tried like this... it's not working...something wrong..
For this you will need a database or a series of files containing each language words for ALL your content. I would strongly suggest using a dedicated system for this on the Asset store, else it will be a nightmare for you to implement if you are beginning. I would strongly suggest getting this, or at least watch the videos to grasp how much work is required to do localization. Can I make it in playmaker? Use ApplicationGetSystemLanguage? It doesn;t make any difference how many languages you want to support or how many textm you will still need to do a very complex system to change texts around. But yes, you can do this is playmaker only. you need to create an Array of strings for each language and base on the current language change the text in your interface by getting the right content from the right array. I think you misunderstand what ApplicationGetSystemLanguage does. The action only looks to the machine what language it is using. I will try to make a video sample how you can do this tomorrow. I still do not know, what ApplicationGetSystemLanguage does. But I use this asset. You can get them from the attachment below. if you need something that is not yet included in the actions, let me know.